My name is Jonathan Roberts – welcome to my website. I am passionate about working with dogs of all breeds, shapes & sizes and am privileged to be a full time trainer. 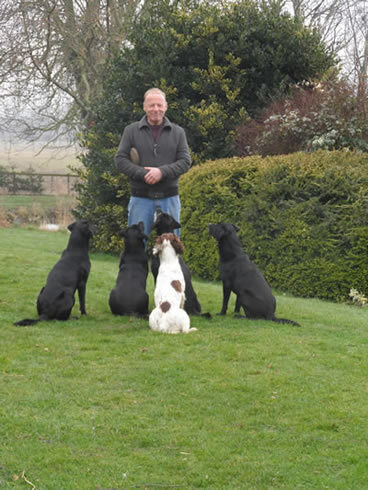 I have owned and trained dogs for more than thirty years and much of my training is based at Crowland Farmhouse near Ancaster, in the heart of rural Lincolnshire. We have fenced paddocks and a spring fed lake that is ideal for water retrieve training or just to cool off. Whilst here, your dog will have the chance to encounter, horses, chickens, ducks and other livestock in a controlled situation, giving you confidence that the training it receives will be effective in the real world. I am proud to be a member of The Institute of Modern Dog Trainers (IMDT). All IMDT members use force-free science based training methods and the welfare of the dog is paramount. My training sessions are designed to be enjoyable for both dog and owner and will help you to forge a rewarding, lifelong bond with your dog. I also work with vets, rescue centres and dog charities to help rehabilitate and re-home dogs. I am fully insured as a dog trainer and behaviourist.